We are beginning to see the garden output increase as the days get longer and warmer. Our tomato plants already have blossoms. Lettuce is beginning to bolt as is our swiss chard. Those will be replaced with more warm season crops. The artichokes are finally done. The last remaining blossoms we left to set flower as they became too tough to eat. But the peas have jumped in to replace them. The peas this year are phenomenal. After last year’s lack luster garden it is nice to see what a difference the city water is making. 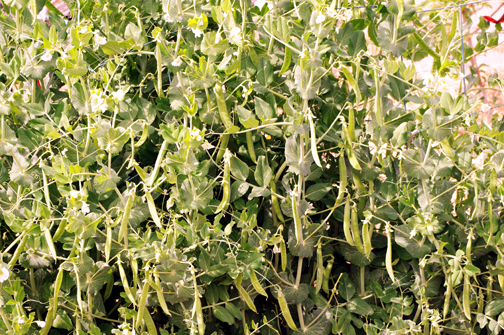 The peas, which never made it more than 2′ high are now out growing our 4′ high trellises. The actual pods are double the size as are the peas inside of them. We also harvested some swiss chard, lettuce (the Cimmaron lettuce has still stayed sweet with no bitterness), strawberries, and of course, eggs. Your total artichoke harvest was impressive! Some of our lettuce and Tatsoi are also now just starting to bolt, but that's ok. Before we know it, it will be tomato season! Now that I'm looking at the post I think the artichoke harvest was larger and I didn't update it. I'll have to check it again tonight. I'm going to let my lettuce go to seed and save the seeds for next year. Our little artichoke plant here in SF is just putting up its first stalk. I'm a proud mama. We're growing two heirloom varieties, one for shelling and one for snap. The shelling variety is Green Arrow and the snap variety is Amish Snap. We got a nice harvest yesterday too. They are definitely outpacing last years crop.